Joel Thomas Zimmerman, to the audiences known by the stage name of Deadmau5, is a famous Canadian disc jockey, musician, as well as a record producer, who mostly focuses on genre of the progressive-house music. Even though Zimmerman debuted in the music industry in 2005 with the release of “Get Scraped” studio album, it wasn’t until he founded his own record label under the name of “Mau5trap” that he became a recognized name. When he established his record label, Zimmerman went on to release his third studio album called “Random Album Title”, which became Deadmau5’s breakthrough work. A mixture of progressive house, electro house, trance and techno music styles, “Random Album Title” managed to spawn seven singles, including “I Remember”, which topped the UK and US music charts, “Not Exactly”, “Alone With You” and “Faxing Berlin”. Around the same time, Zimmerman began working on collaborations with other artists, most notably with Kaskade, with whom he released a largely popular song entitled “Move for Me”. The single proved to be a huge success, as it peaked at #1 on the Billboard Hot Dance Airplay chart and was later featured in a rhythm video game “DJ Hero 2”. However, this video game is not the only one to feature Zimmerman’s music. His tracks appear on such popular games as “The Sims 3”, “Sound Shapes”, “Saints Row: The Third”, “Grand Theft Auto IV”, “Need For Speed: Most Wanted”, as well as others. A famous record producer, how rich is Deadmau5? According to sources, Deadmau5’s net worth is estimated to be $45 million. Undoubtedly, most of Deadmau5’s net worth and wealth comes from his music career. Joel Zimmerman was born in 1981, in Niagara Falls, Ontario. Zimmerman’s interest in music showcased itself during his childhood, when he received his first keyboard and started creating music. Zimmerman’s desire continued throughout his teenage years, until he eventually released his first studio album “Get Scraped”, which was followed by “Random Album Title” and his fourth studio attempt called “For Lack of a Better Name”. Some singles of the album were created in collaboration with such producers as MC Flipside and Rob Swire from a drum and bass band called “Pendulum”. “For Lack of a Better Name” followed the success of its predecessors, and topped the music charts in addition to spawning six singles, including “Hi Friend!” and “FML”. 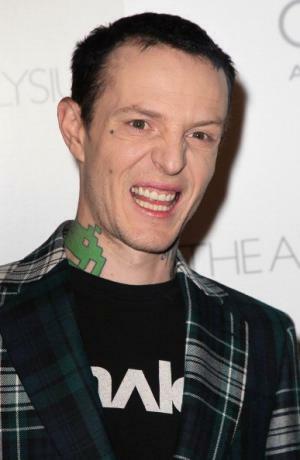 Both of the latter songs were featured in a teen drama series called “Gossip Girl”, where Deadmau5 also made an appearance, as he starred alongside Blake Lively, Leighton Meester, Taylor Momsen and Chace Crawford. Deadmau5’s latest studio attempt was released in 2014 under the name of “while (1<2)”, on which he collaborated with Trent Reznor’s “Nine Inch Nails” and “How to Destroy Angels”. Since his debut in the music industry, Joel Zimmerman has had an opportunity to work with such artists as Chris James, Gerard Way, Kaskade, Colleen D’Agostino and others. Zimmerman’s contributions to music have been acknowledged with several Juno Awards, as well as five nominations for Grammy Awards. 1 He has German, Swiss, and English ancestry. 2 Engaged to Katherine von Drachenberg [December 16 2012]. Ecstasy 2011/I performer: "Move For Me"
Beyond Aperture 2011 Short performer: "Bleed", "FML Again", "Creep", "Strobe"
Gran Turismo 5 2010 Video Game performer: "I'm Not Alone deadmau5 Remix"
GoldenEye 007 2010 Video Game performer: "I Remember"
2010 MTV Video Music Awards 2010 TV Special performer: "Billionaire", "Ridin' Solo", "Dancing On My Own"
Grand Theft Auto IV 2008 Video Game as J. Zimmerman, "I Thought Inside Out Original Mix", "No Pressure Deadmau5 Remix" / performer: "I Thought Inside Out Original Mix"
The 54th Annual Grammy Awards 2012 TV Special performer: "Rope", "Raise Your Weapon" / writer: "Raise Your Weapon"
2015 Grammy Grammy Awards Best Dance/Electronica Album For the album "While(1<2)." 2013 Grammy Grammy Awards Best Electronic/Dance Album For the album ">album title goes here<." 2012 Grammy Grammy Awards Best Dance/Electronica Album For the album "4x4=12." 2012 Grammy Grammy Awards Best Dance Recording For the song "Raise Your Weapon." 2012 Grammy Grammy Awards Best Remixed Recording For the recording "Rope" (deadmau5 remix).